Princess Amelia Mignonette Grimaldi Thermopolis Renaldo may seem like she's the luckiest girl ever. She's a princess, for starters. And while she's no supermodel, mirrors do not crack at her reflection. Best of all, she finally has a boyfriend. The truth is, however, that Mia spends all her time doing one of three things: preparing for her nerve-wracking entree into Genovian society under the slave-driving but elegant Grandmere, slogging through congestion unique to Manhattan in December, and avoiding further smooches from her hapless boyfriend Kenny. All she wants is a little peace and quiet...and a certain someone else to be her boyfriend. For Mia, being a princess in love is not the fairy-tale it's supposed to be...or is it? Listen to the whole Princess Diaries series. 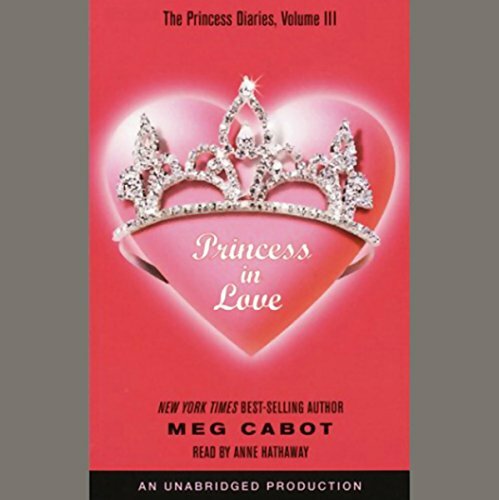 Meg Cabot's Princess Diaries series is a sure bet for tween girls who like funny stories and Anne Hathaway brings the audiobooks to life with her expert narration. I was laughing out loud as I was listening to this (and the first two books in the series). Anne Hathaway is the perfect narrator. Where does Princess in Love rank among all the audiobooks you’ve listened to so far? I love this series. Anne Hathaway was the perfect narrator after she was Mia in the movie. She makes the audiobooks. I started reading this series when i was 9 and for the longest time i thought that Princess in Love was the last book in this wonderful series. I must have re-read at least 20+ times over the years. Thinking it was the last book made it all the more special. My favorite part of the book is when Michael is all impatient at the end trying to understand if Mia really loves him or not and all she can think about is how he could have out about the cards. Meg Cabot is a great author and I Love all her pop-coulture references. This audiobook was really made special by Anne Hathaway's narration. She really knows how to play the part of Mia and add emotion and depth to her diary entries. I was really sad to find out that she wasnt te one to narrate the rest of the series but I'm glad she at least did the first three books. I totally recommend this audiobook! I like the princess diaries series very much because, even if the main character is kinda whiny, she tries to do her best and has a great sense of humor. Also, I loved how Anne Hathaway narrates it too!! The only good thing about this book was how Anne Hathaway read Mia and the other characters. I loved the movie and I love the book too, I love how Anne Hathaway narrated the book!! The ending is perfect and so satisfying. Thank you Meg Cabot for fulfilling my dreams.